This post contains affiliate links –I earn a small commission if you make a purchase. Thanks for supporting Whistle and Ivy! Sis is getting SO big. This morning she grabbed a large pink comb from a bathroom drawer as I was blowdrying my hair and starting combing her wispy curls. I stared at her, realizing my baby is now a fiercely independent toddler. And it happened in a blink of an eye. As I was looking through some photos from last year, I found some patterns that didn’t get published. I simply ran out of summer! 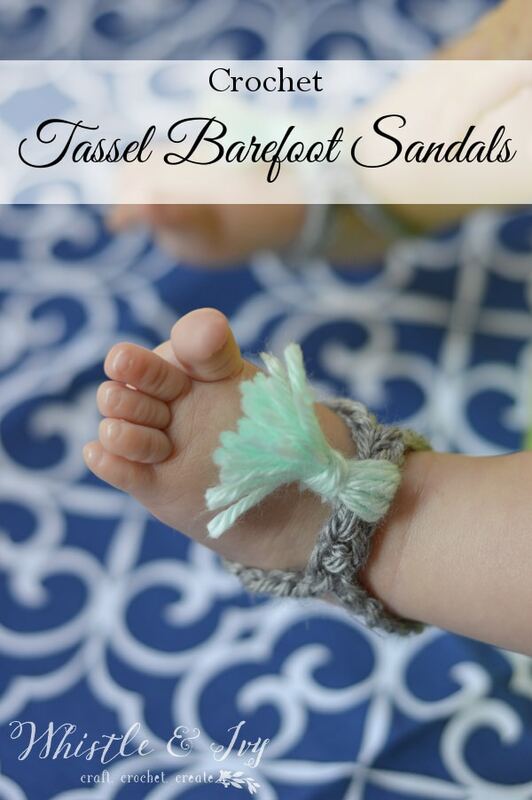 These adorable Crochet Tassel Barefoot Sandals are SO cute. And now I get to reminisce about last summer, when my baby was still a baby and she would sit in her Bumbo seat while I took pictures of her chubby little toes. You know how I feel about quick projects! These adorable sandals do not disappoint. If you are wanting a baby project that literally take MINUTES, this one is for you. They only take a few feet of yarn, so they are a perfect stash-busting project, and I think they would sell great at summer markets and fairs. To make the stretchy bottom part of the sandals, click over to my original barefoot sandal post. 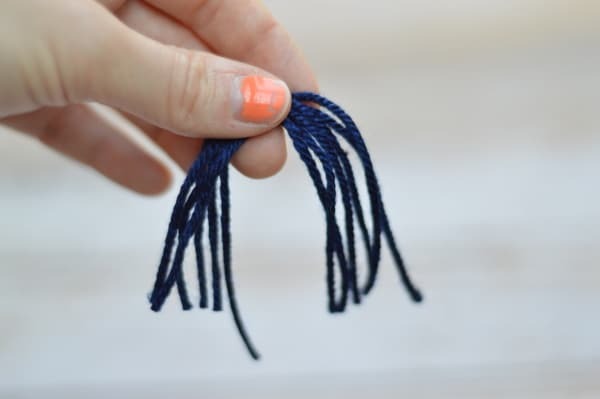 Once it’s made, you can make the tassel to go on it. Begin by cutting a length of yarn about 6″ long and set it aside. Using the same colored yarn as your 6″ piece, begin wrapping around your hand, about 5-6 times. The more times you wrap, the fuller your tassel will be. 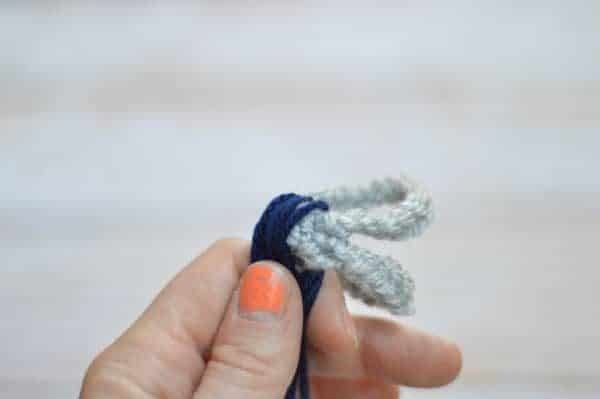 Grab the top of your wrapped yarn, holding them together, and snip the bottom. 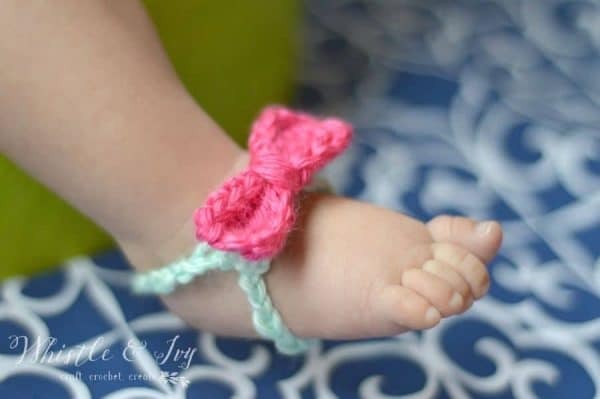 Next, wrap the yarn around the middle top of the barefoot sandal, and pinch in place. 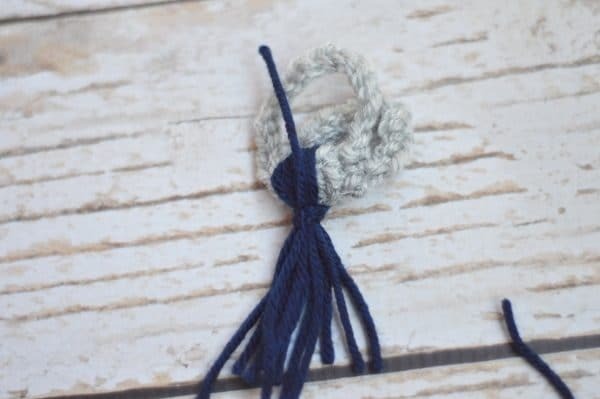 Grab the piece of yarn you set aside, and wrap it around the tassel, where you are pinching. 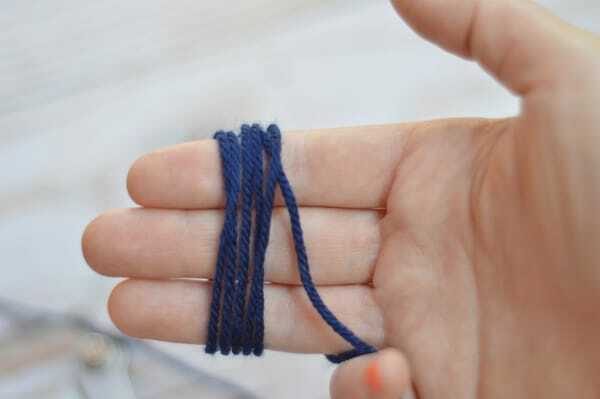 Tie it in a sturdy knot and pull the ends up and down when you tighten to hide the knot better. Trim the ends and you are finished! These sandal are easily customized for size, you only need to add more chains. The elastic makes them extremely forgiving, and they will fit a variety of ages, regardless how you decide to make them. 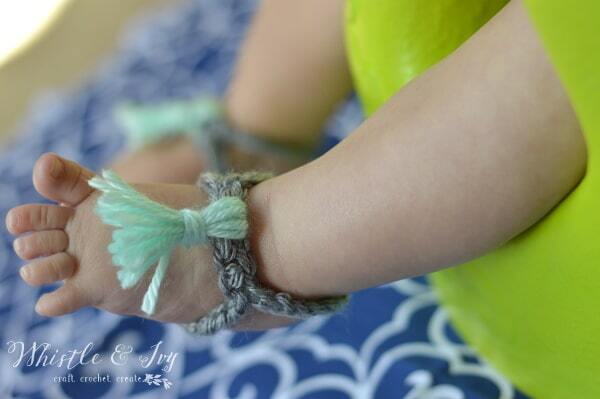 I hope you enjoy these crochet tassel barefoot sandals! They look darling with a summer dress. Show me what you’re working on! Join the Whistle and Ivy Facebook Group. 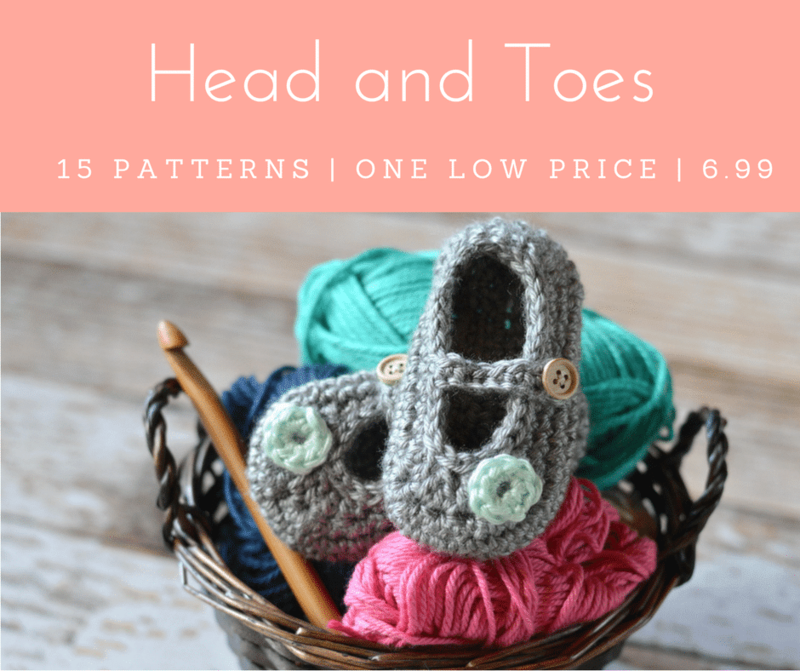 Click here to subscribe so you don’t miss any crochet awesomeness. And follow me on Facebook and Instagram for behind the scenes photos and crochet inspiration. Good evening mam and warm greetings from South Africa Just need to know can this pattern work without the elastic? Hm. It would be difficult to get on and off the foot without elastic, I am sorry! HAHA! Oh my goodness, THANK YOU for commenting! I took these last year and almost retook them when I scheduled it last week, but I decided not to and hoped people wouldn’t be too grossed out :) You are AWESOME! These are tooooo cute! thanks so much for sharing at Merry Monday! Oh my cute. 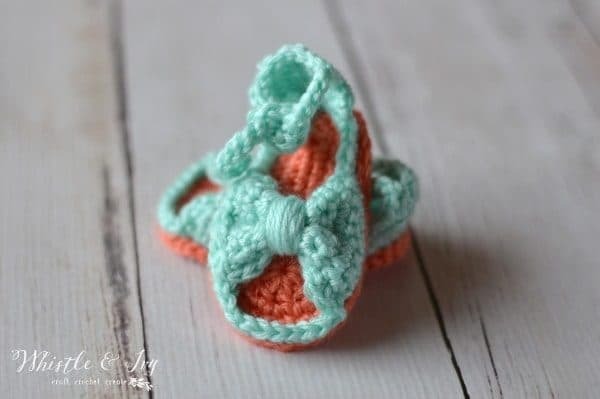 I need to learn to crochet so I can make these for my little babe. 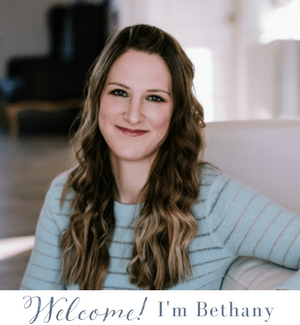 Thanks for sharing at the Monday Funday Link Party – Emily!